A heart-wrenching poem about an abducted boy called Simon – who lived nearby, was my age and sorta looked like me – in Surrey, BC 1982 – by the “Beast of BC” Clifford Robert Olson (NO relation). Recorded and contributed to Dark Poutine Canadian True Crime podcast – shared here for posterity etc. RIP Simon and the others. Oh Mom, there are so many thing to tell you about this last year… the short is: for the first time in a loooong time, i have hope, optimism and a bit of peace. Last year included a trip to Logan to deal with the rest of your items including the missing Agatha Christie books (still missing), green glass (duly distributed) and various bins of letters, treasures and papers. Long weeks at Anders’ place sorting it all as best as possible. Had hoped to scan, inventory etc everything but gave, as you’d say, “a lick and a promise”. Assembled boxes for sons, brothers, and Lonnie Gee, Doug and Dan et al to spread memories around the world. Learned so many things about you! Flight attendant job applications, letters from Grandpa and Lorayne, records from your college days (so many colleges), oh made office supply kits for the Grandkids, and loaded up all your stationery/letterhead/letraset/postcards stash for me. And using it all too. Also (almooooosssstttt) finished dealing with the conundrums with Service Canada (a true bureaucratic nightmare of nonsense) and your headstone should be arriving anyday from India (thans Uncle Bob) – i designed it and am so proud to do so. Also your ashes are well on their way around the world with stops in Pacifica, Logan, North Van, Pe ELL, Olympia, Nusa Ceningan, Sarpsborg and so on. Anders did a great job getting little vials filled up. Big news: your wedding dress is getting altered and put into service for dear Ryoko (you’d love her) and, i ordered (finally!) my own kilt. Royal Stewart with Cape, formal sporran, Prince Charlie jacket and socks etc. April 20-21 will keep your ashes with me to feel your energy in some weird (totally not macabre way). No doubt this week is tough every year as the anniversary of Dad’s death/funeral and your birthday all at once. So i write and make documentary art. So much more to tell you but must be careful of my energy and screen time. So, in doing this all, i did photo-inventory many of your travel treasures. Sharing here to keep your story alive. Speaking of “your story”, got your blog and Flickr and Ancestry all backed up. Learned a lot about impermanence of the internet. Frustrating as i want to be meticulous but also realize perfection is entirely overrated. When going through my late Mom’s archive of documents, ephemera, photos, letters etc, came across this beautifully executed resume for my late Dad. The two were divorced after this time and very different people in general. Notably the multi-page dossier took me back to a time when the family was intact, before the rather tumultuous times which followed: Dad is smiling, has a Ed.D (Doctorate of Education which begat his nickname “Dr. O”) to his credit, and was fresh out of a few notable university gigs at Michigan State University (Lansing) and University of British Columbia (Vancouver) after earning his degrees at University of Oregon (Eugene) and BYU (Provo). I see out last family address and phone number and the names of my brothers which allow me to date-stamp to probably 1981-3. As it goes, he soon switched careers going into real estate sales (as Mom had recently done) at which he was diligent and successful by most any measure except some emotional categories. He also taught real estate licensing classes relying on his education education. He died of cancer in February 11, 2014 at age 73. 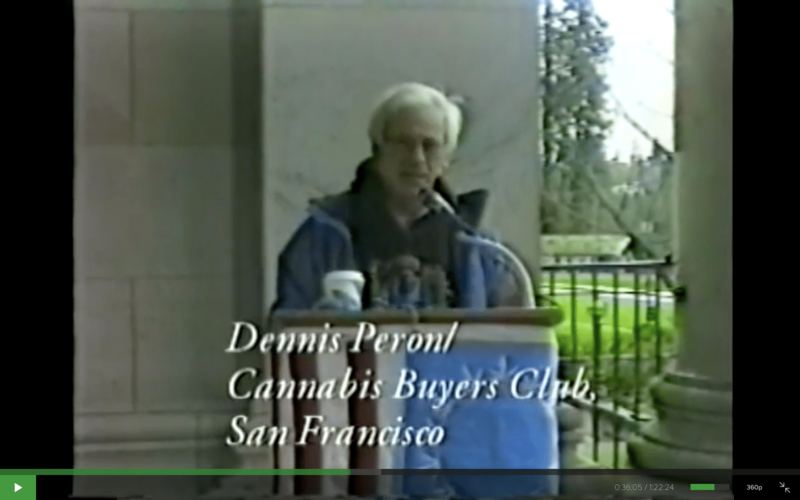 An exceptional public speaker with charisma for days, goodly Dennis Peron (as seen in my documentary HempenRoad film) speaking at a Hemp event of some name or another in Olympia, Washington in 1996, just before Prop 215 passed – which was the (arguably i suppose) first big domino to fall in the cannabis legalization / normalization movement. He stood up to the government stooges with bravado and vigour and rallied disparate communities to the crusade with compassion as the central theme – a brilliant communications strategy among other things. Was charmed and captivated by his style and amazed at his polished & nuanced public speaking style with frankness & subtle wit. Serious topics delivered with casual ease and fierce determination. A pro in a league (at that time) of well-intentioned amateurs. 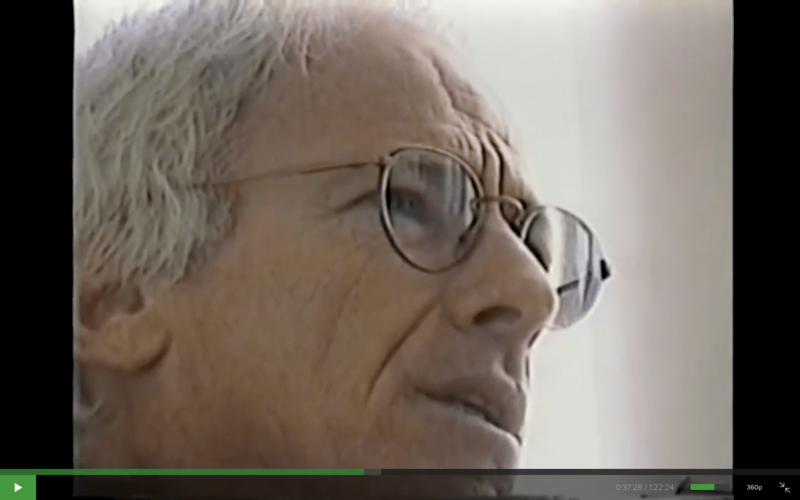 When making my lil film i wanted to give new voices a chance to share their stories and as such, avoided the then “big timers” who were churning out books and on the pulpit banging circuit, but wanted to include him as he was “not a hippie” and coming from a different direction at the problems than the usual suspects. He was gracious with his time and invited us to come to California to film part 2 – something i so very much wanted to do but never happened. He lived long and well but (as we all will) succumbed to a health conundrum a few days back – as i live elsewhere in the world most of the time these past years i lost track of his actions but when asked about him in SF a couple of years back, he was spoken of in revered terms usually reserved for mafia dons. Be it known, there are not many of us who can pass away knowing we changed the course of history and he is definitely one who can. He likely didnt remember our encounter (or maybe even see the film) but he made a significant impact on me as an activist and communicator. 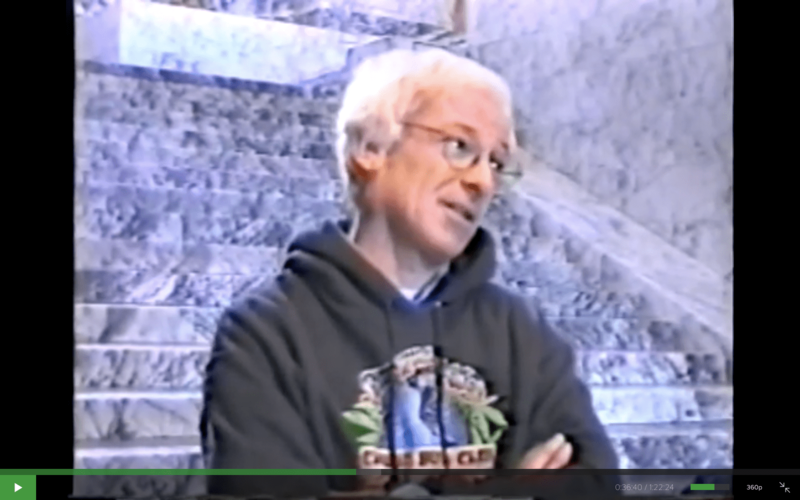 PS See his bit in HempenRoad and witness charm in action at the Olympia Hemp (something) at Capitol Bldg in 1996. Go to 35:55 minute mark. MY BELOVED HEROIC MOTHER. LOVE YOU FOREVER. DEVASTATED. We go to her empty home. PS This is the very last second i saw and touched and kissed my Mom before heading to another airport for another adventure. Would never have guessed. I resolve to face all challenges and adversities calmly, cheerfully – and with a bowl of oatmeal – as demonstrated in this post-apocolyptic situation in which i clearly saved the world and regrew the forests, all while looking sharp in my the plaid and specs. Resentment? Bah! Suffering? Happens! Hugs? Still free! The next few days will require me being soft and open to live, understanding other people’s points of view and motivations and moving peacefully (and restfully) through the stream and let the current of the story pull me along. Am bound by aeroplane to Los Angeles to meet up with brother number one. Together we will drive to Las Vegas to meet our other brothers and father for some family discussions of importance. Brother’s wife has prepared pumpkin soup, Japanese-style, for when I arrive. In 1992, when I first arrived in Japan, my brother fed me the same kind of pumpkin soup (though I’m sure not as good as this evenings version) and I wrote a haiku about that first night in Japan. The poem is painted on rice paper in my mix of Eastern and Western art sensibilities. The poem is especially appropriate for me as I need to feel the texture bottom of life right now. And just when I thought life couldn’t get any weirder, I’m on the plane just about to taxi and just got some more strange, news that affects me greatly, yet I have no ability to control. When the going gets weird, the weird go pro. Also, brother Andrew with moving into his own place so I had to dual purpose of giving him a bit of celebration and moving help (Nina include it with the help). At this point, I was in pretty deep with my own illness but booked a ticket to Los Angeles where I would plan to meet up with older brother Bob Olson and drive to Vegas for the rendezvous. Kris Krüg dropped me off at the airport in the rain, got my wheelchair, through security blah blah blah. Keep in mind airplanes and travel in general is pretty tough for this guy but determined to do what my dad wanted. Just as the airplane cost, announcements about buckling up and all that, and I reach down to turn off my phone to receive a call from step mom said dad was back in the hospital and unable to make the trip. At that point, I had the choice of either making a big commotion and asking/demanding to be let off the plane and then likely being arrested or barred from flying for an indefinite period, or hunkering-in and do the trip. “You buy the ticket, you take the ride“ the good doctor said. Of course, I did the trip, and let’s just say it was challenging. Sure all the brothers showed up but there was no place to stay as the timeshare condo had been canceled when dad was unable to go #EyeRoll so we were scattered around various makeshift hotel rooms, couches and the like. We went out for a night, and tried to smile through it but the vibe just wasn’t right (for me anyway but maybe for others). Note the Las Vegas trip is the worst possible environment for a guy in my condition who deals with massive sensory overload from even mildly stimulating environment. Let’s just say I overcompensated. Brother Bob bugged out towards home the next day, Dan & James at some point after helping Andrew move into his new house… details, although completely unnecessary, are fuzzy but I just remember laying on the little grassy field in front of it with my head spinning with ridiculous pain and anxiety. My return ticket wasn’t for several days later so I holed up in the Excalibur hotel with black out curtains drawn and fogged out on the prescription meds I was taking then. Then got shelter at Cory DeMille’s house Where he kept an eye on me, played our favorite all time records then somehow I was at the airport and back to Vancouver but honestly I have no recollection of this part. Dad would die a month later, 3:30 AM while I held his hand. Anyhow,.. Didn’t mean to be cryptic with this announcement, but it was realtime on the airplane as I was wondering what the fck to do. Thank you for all your support and kind comments several years ago. 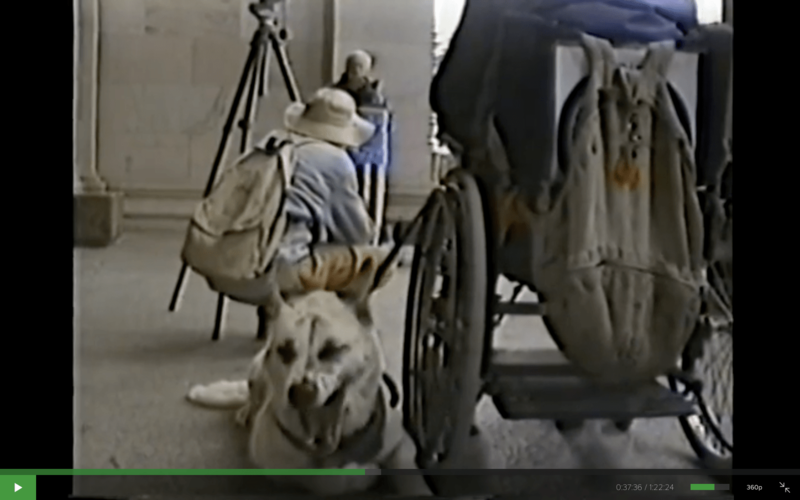 Both a preview and recap of SXSW 2009 as Uncle Weed and the Quebecois Correspondent discuss the noted media conference and extravaganza featuring UW’s spiel F@ck Stats, Make Art – a soliloquy for quality and integrity in creation. Along with live recordings of Geoff Berner, and The Black Angels comes a recounting a perfect day of upgrading heroes, tasty food, and Austin Psychedelic Music Fest plus more highlights including: RiP Remix Manifesto film, micro-brews at Gingerman, Bruce Sterling, and hugs with new friends. The Golden Dawn started out in the murky time and space of Austin, Texas in late 1966, along with many other wild groups now holding legendary status, but most notably with the kings of the Texas Psychedelic scene, the 13th Floor Elevators. George Kinney and Roky Erickson of the Elevators grew up together and played in high school bands with each other, and by the time of the Great Mind Expansion, the Elevators and the Dawn were in close contact. SXSW 2008 Choogle on podcasts – 6 tasty episodes!